They may be vintage in design, but Bundt pans can prove to be very beneficial both inside and outside of the kitchen. You can use Bundt cakes for several other things! Great for organizing and decorating, a Bundt cake pan can come in handy all over the house! Make an Organizer: Stack Bundt pans of different sizes to create a decorative organizer for food, craft supplies, or other nick-knacks. Personalize it further by spray painting the pans to match your décor. Make a Wreath: Spray paint an old Bundt pan to look like an apple, pumpkin, or peppermint candy. This is a fun and unique decoration that will surely add character to your home. Organize Makeup: Keep your counter clean of clutter with this cute makeup organization idea. Use the hole in the Bundt pan to hold your makeup brushes and place your must-have’s right in the bowl. Roast a Chicken: This is a genius way to roast your chicken. With the chicken standing upright in the oven, the fat will drip off the chicken and into the bowl, making this a clean and healthy roasting alternative. Peel Corn on the Cob: Not a fan of eating corn ON the cob? Remove it from the cob by placing the bottom of the cob in the small hole in the Bundt pan. Run your knife down the cob and all those sweet little kernels will collect in the bowl of the pan. Create a Wind Chime: Old antique Bundt cake pans are great for this project. Attach ropes of beads, bells, buttons, or charms to the Bundt pan and hang it outside for a cute, eclectic decoration that will liven up any garden. Make Wall Décor: Arrange Bundt pans of various sizes and shapes on the wall for a cool 3D decoration that is great for both living rooms and kitchens. Color the pans if you’d like, or leave them as is for a cool rustic touch. Create a Party Sandwich: Don’t worry about ordering subs for your party, create a party sub right in your kitchen with a Bundt pan! This could easily feed 8 to 10 people, depending on the size of your pan, and it’s a fun activity to do for family dinner night! Make a Decorative Ice Cube: Keep punch and other drinks cold with a Bundt pan ice cube. Use a small Bundt pan to create a decorative ice ring and place in punch bowl to keep your drink cold. For an extra decorative touch, drop cranberries, flowers, or herbs in the ice cube for added color and flavor. Create a Garden: Create fun planters using old Bundt pans. Try herbs or succulents for a cute garden decoration. A Bundt pan with succulents would also make a great housewarming gift for friends and family. I’m notorious for gathering and saving those little shampoos and soaps from hotel rooms. Why? I have no idea. It’s not like I do a ton of traveling where having a stock pile of tiny soaps would be beneficial to me, but for some reason I just like collecting them…I like knowing I have them should the need for a little conditioner arise. Ironically, these little shampoos have taken up more space in my closet than a full bottle of shampoo…so I needed to find some way to store these supplies that was convenient and space-friendly. Enter the amazingly large, easy and cute Stash Buster Tote! This crocheted tote can literally hold tons of stuff…and the V-stitch allows it to keep its shape while you stuff it with anything and everything you can imagine. Made with 2 strands of yarn, this tote is durable and strong…and it works up quickly, so it’s a great project for a weekend or a rainy or snowy day spent inside. This tote would also be great for storing fruit and veggies, craft supplies, toys, jewelry, makeup, and other little essentials. You can make them in different sizes and shapes by altering the pattern just slightly. Continue round 5, just increase an additional dc in each round (so the next round would be ch 2, 2 dc in first st, dc in next 4 sts) for a bigger basket, and omit round 5 for a smaller one. You can also make the basket walls as high as you’d like by continuing or halting rounds when you get to round 7. Special Abbreviations: V st: (dc, ch 1, dc) all in the same st. or ch. As you can see, you’ll be making little V’s all around the basket. This pattern requires holding two strands of yarn. Ch 2 does NOT count as a st. Ch 4 does count as dc and ch 1. With 2 strands of yarn held together, ch 4, sl st in first ch to create ring. Rounds 7-15: Sl st into first ch 1, ch 4, dc in same ch 1, (V-st in next ch 1) 29 times, join in 3rd ch of ch 4. (30 V-st) if you want your basket to be higher, you can continue this for five more rounds, for a total of 20. I thought 15 was plenty for me. Round 16: Ch 3 dc in each dc from previous round, join in top of ch 3. I’m all about reusing and recycling. I love thinking of new ways to use old materials and using things like jars and cans to better organize my crazy life. If you ask me, an aluminum can is just too valuable to toss into recycling. There are about a billion ways that you can use it to organize everything from your craft room to your bathroom. For this project, I used an aluminum can to make a nifty container for all my crochet hooks and knitting needles. I also attached a piece of elastic band around the can to hold smaller items, like tapestry needles. This is an easy project that anyone can do! You could even gather a group of cans together to create one heck of a desk organizer. Paint your can the color of your choice. Once paint is dry, cover with 1 layer of Mod Podge. Let dry overnight. Add a dab of hot glue on the back of the can and secure one end of the elastic band. Wrap the band around the can and secure the other end with hot glue over the previous end. Pull band a little tight when you wrap it around so the needles will stay secure against the can. Embellish with a paper flower or embellishment of your choice. Fill with your crochet hooks and knitting needles and you’re good to go! This past weekend was one of my favorite quarterly projects…Spring Cleaning! I love spring cleaning so much that I do it once a season…sometimes twice. Yes, I’m THAT person. I’m that much of a nerd. To be fair, I do have a lot of crap…and I live in an apartment with hardwood floors, lots of books, and windows that stay open quite often…so there’s lots of dust. I also live with a boy…and, well, we all know how that goes! So when I do my spring cleaning, I like to start one room at a time and just take my time going through things and throwing stuff away. This year I started with my jewelry. I needed a way to store all my earrings so I could see all of them at one time. I had some left over wire shelves from my craft unit I showed you a few weeks ago, so I tied a ribbon to those and was able to hang hooked earrings on them. It looks oh so chic! As for my studded earrings, I needed a way to store them that wasn’t in a little bowl in my dresser. So I decided I’d do double duty and create a storage system that was also decorative…bada boom! These sweet earring frames are so easy to make and they’re a great way to store your studded earrings in a way that looks professional and stylish. Take the backing off the frame and remove the glass/plastic part. 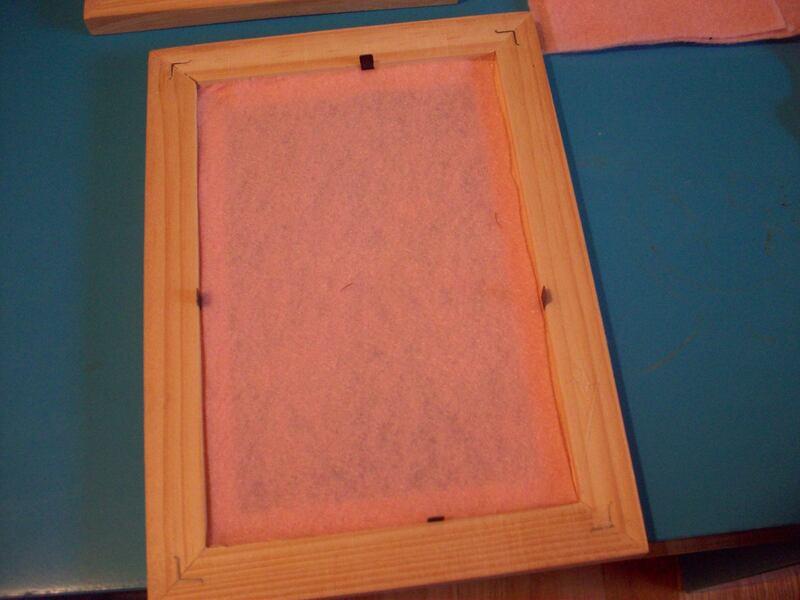 Lay it on your felt and cut out a felt rectangle, using the glass/plastic as a guide. Hot glue the felt piece to the inside of the frame where the backing used to be. Don’t put the backing back on because you want to be able to poke your earrings through the felt. That’s really all there is to it. 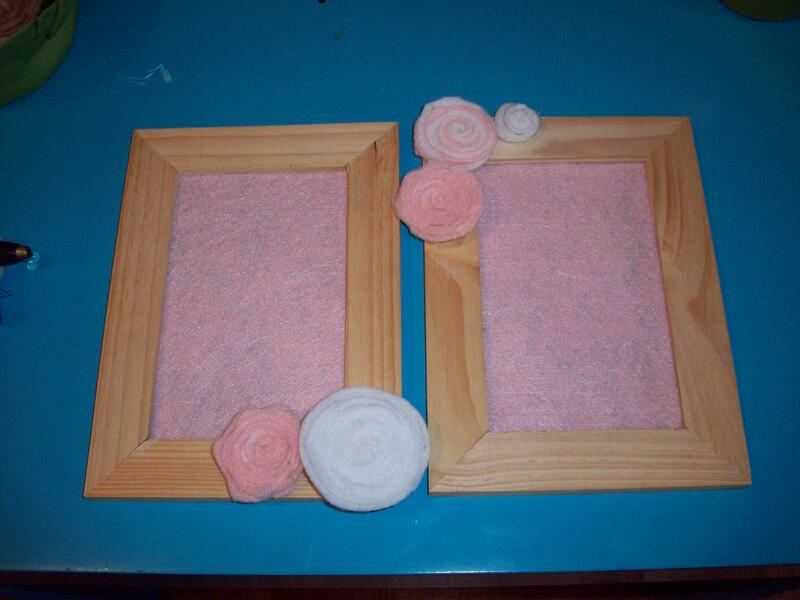 You can add felt flowers if you’d like to give it a feminine touch. Then hot glue a ribbon to the back (if there isn’t a wall hook on the back of the frame) and you’re ready to go! To attach your earrings, poke them through the felt and secure them on the other side of the frame. Since I’m a renter, I can’t really drill massive and awesome storage units into my bedroom wall. And since my apartment is small, I can’t really afford to waste space with units that sit on the floor and take up room…and since I’m a bit of a crafty minded person, I have a LOT of necklaces. I needed a way to store and display them so they wouldn’t get tangled and messy. I have to thank my brilliant man friend for this idea. I had these great mini hangers that I also got from IKEA, but they put huge holes in the wall, which I didn’t want to do. He suggested simply attaching them to my dresser, also from IKEA, and hanging my necklaces there. Um…genius. Instead of having to drill screws into the wall to hang up these awesome hangers, all I had to do was push a thumb tack through the hole and into the dresser. My necklaces aren’t super heavy, so that was all the support they needed. This is a great space saving idea for ladies who live in little lofts and flats. As for my bracelets, which I don’t wear too often, I simply threw them on some glass vases (wait for it…ALSO from IKEA!) and threw some fake flowers inside the vase. Boom. Storage with style! I’m pretty OCD when it comes to craft storage and organization. I think there are times when I’m actually too organized to the point where I can’t find anything when I need it! After my recent move, I wanted to downsize my craft supplies. Like all my fellow craft lovers, I stashed scraps, beads, and pieces of paper…hoping I’d use them for something. Needless to say, they sat in a box for a good 2 years, unused and unloved. I had some leftover storage bins from Target and I decided to use them to store my craft supplies. That way, whatever fit would stay…whatever wouldn’t fit would go. I had a unit that would hold 6 bins…so whatever didn’t make the cut was donated to other creative minded people. I also decided to use various scraps and embellishments to decorate my storage containers. I mean, why not? If they’re going to hold craft supplies, they may as well be pretty! Today I’m going to show you how I made my yarn bin. It’s very easy to do and great if you’re looking to rid yourself of a few fabric scraps! 1. Gather your supplies. Make sure your piece of fabric is long enough to wrap around the box without you having to cut it. 2. With your needle and embroidery thread, stitch the fabric to the bin using whatever kind of stitch you like. If you’d rather not hand sew, you can hot glue it and then decorate the seam with ribbons. I just stitched on the four sides, trimmed off the excess, and hot glued the fabric to the top and bottom of the bin. 3. To make the pocket, measure one piece of scrap fabric so it’s the width of your bin and about half the height. Measure the other piece of fabric so it’s about an inch shorter on all sides. 4. 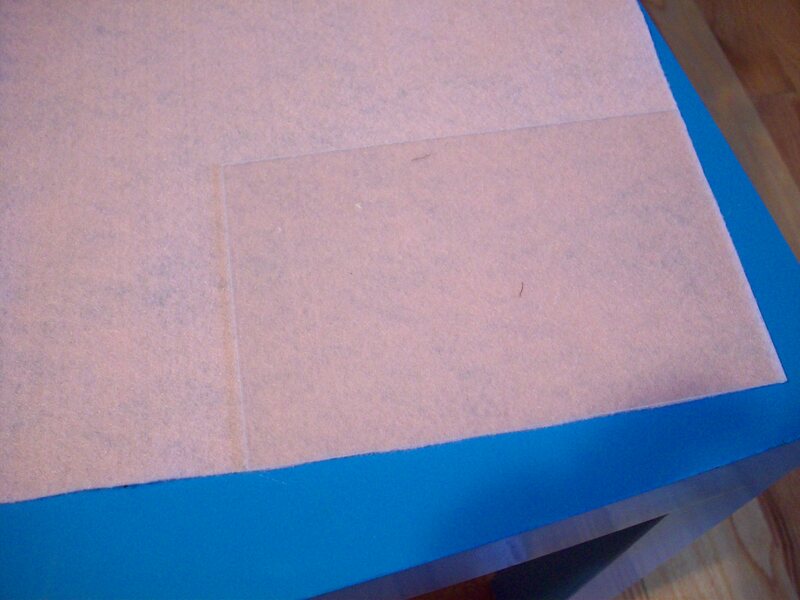 Use either your sewing machine or hemming tape to seal the two pieces of fabric on the bottom, left, and right sides. You could also use a glue gun if you’d like. Make sure to leave the top open for your needles. 5. Place your needles loosely in the pocket. With a needle and some embroidery thread, thread small pieces of yarn between the needles like so. 6. Tie the string together and move the knots to the back of the fabric. 8. Hot glue your pocket to the front of your bin and place your needles, crochet hooks, and other little tools inside. 9. If you’d like, you can hot glue a ribbon to the front of your pocket to hide your little stitch marks. 10. Glue the ribbon right below the top edge of the fabric so as not to close any of your needle holes. And there you have it! Wanna see my other bins?